Thanks to the enactment of the American Innovation $1 Coin Act by Congress, which was recently passed by the Senate on June 20th, coin collectors and numismatists alike can expect another U.S. dollar coin series to come to fruition in the beginning of 2019 — The American Innovation Coin. The United States Mint will soon begin to strike and issue these new $1 collector coins in recognition of American innovation. Each coin will feature a significant innovation from each state throughout American history and the individuals who have pioneered these great movements and advances. In accordance with the Act, the American Innovation Coins will be issued at a rate of four coin designs per year, beginning in 2019, and run for 14 years for a total of 56 unique designs. Initially introduced on January 31st, 2017, H.R. 770 was passed by the house with the amendment to begin coin minting in 2019 rather than 2018. It was then passed on Wednesday, June 20th 2018 by the Senate with one additional amendment — to have the state coins released in order of their respective unionization dates rather than in alphabetical order, followed by the District of Columbia and the five U.S. territories. The U.S. Mint plans on striking an introductory 2018 $1 coin to begin the series before the individual state designs are developed. Its reverse will bear inscriptions of ‘United States of America’, ‘American Innovators’, and the signature of President George Washington that was used on the first U.S. patent, No. 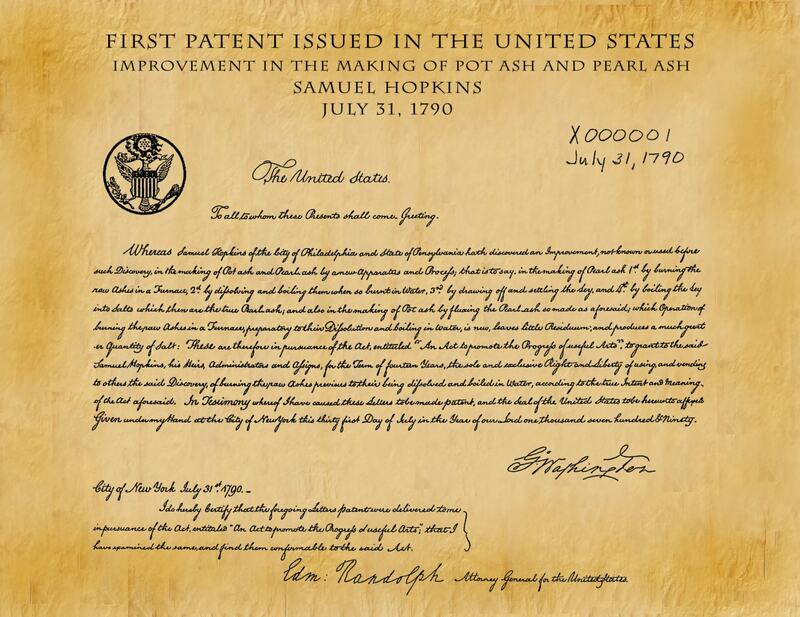 X000001, that was issued on July 31st, 1790 to Samuel Hopkins for the making of pearl ash (potassium carbonate); a fertilizer solution which revolutionized American Agriculture. On July 31st, 2018, the United States Mint unveiled a few of the initially-proposed designs for the 2018 American Innovation Coin, but unfortunately due to discrepancies and disagreement within the Citizens Coinage Advisory Committee (CCAC), none of the options were decided upon, and the board passed a unanimous motion to not review the designs. Apparently, the meeting took a turn for the worst when a few members appeared arrogantly agonized by the design concepts that were before them. Ah, the agony of being given the privilege to help shape the direction of U.S. coinage history — they must really have it tough. Despite all the conundrums faced, numismatists should hold out hope as the U.S. Mint officials and their artists did take away a few insights from the ordeal and hope to have new design concepts in the near future. After all, these coins are required to begin production by federal law before 2019. The only design elements we can expect to see with absolute certainty is an obverse (front face) design that is symbolic of Liberty (most likely Lady Liberty) with the inscription In God We Trust, which will be shared across all 56 coin designs. One provision also prohibits the use of any portrait or bust of any person — living or deceased. For the reverse side of the coins, the Secretary of the Treasury for each respective state must select the innovation, innovator or pioneer, or group to be featured after consultation with the Governor and other chief executives of the state or region. New Dollar Coin: First Step Towards Abolishing The Paper Dollar? While it is likely that this could be one of the long-term goals behind the unveiling of these new coins, dollar coins have been used side by side with the paper dollar since it first began in the 1860s. We live in a free country in which people will still have the option between using both forms of currency, and there are minimal signs showing that society as a whole will make the switch from paper to coin currency, although it could lead to less new paper currency being printed in the future. Overall, these coins will be relatively similar to previous dollar coins in terms of usage. They will be produced in circulating, proof, and uncirculated finishes solely for coin collectors. They will be struck alongside the existing Native American, or Sacagawea, dollar coins. For more numismatic news, browse our other articles at Preferred Coin Exchange, and reach out to our numismatists for a personal coin collecting consultation.